This vegan garlic mayonnaise recipe is inspired by my amazing Grandma; through the years, she has produced batches upon batches of homemade garlic mayonnaise for my dad and his friends. The other day, I suggested that I could pop over and she could help me develop a vegan garlic mayonnaise recipe, but she wasn’t too impressed at the lack of eggs (she isn’t really impressed by the vegan diet!). Nonetheless, I still gained a nugget of information from her: add the oil slowly so that the mayo doesn’t split. My Grandma also added that the recipe that she was currently using was rubbish – the recipe had suggested one clove of garlic, but she’d put in ten and still didn’t think that it was strong enough! So this recipe is just a small variation on my Simple Vegan Mayonnaise recipe with a pretty big flavour upgrade! The only difference is the amount of garlic – simple as that. Feel free to alter how much garlic you add based on the flavour intensity you’re looking for. Three cloves produce a fairly strong flavour, so if you’d prefer something milder, just add two. On the other hand, if you want a mayo as strong as my grandma likes it, go crazy and add four, five or even ten cloves! You can also alter the amount of Dijon mustard depending on the kind of tang you're looking for - if you have a mustard allergy or simply don't like mustard, then the mayo is absolutely fine without it. However, if you want your mayo to have a bit more of a kick, go on and put another teaspoon in! Makes around 125ml of mayo (½ cup). Prep time: around ten minutes. Blend together the aquafaba, lemon juice, garlic and Dijon mustard in a high speed blender or food processor. Bit by bit, as the food processor is running, add 120ml (½ cup) of the vegetable oil. As my Grandma says, remember to add the oil slowly so that you form an emulsion and so that the mixture therefore does not split. Pour the mixture into a bowl and whisk in the remaining vegetable oil. And that's it: now your vegan garlic mayonnaise is ready for your vegan kebab, burger, or anything that takes your fancy! Enjoy! 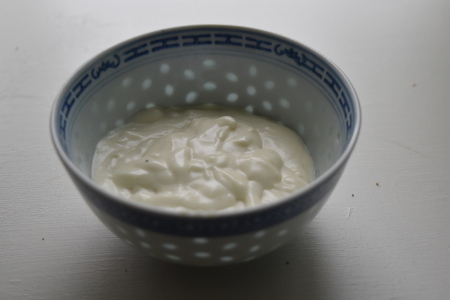 Want to know any more about vegan garlic mayonnaise? Mayonnaise may contain a lot of fat, but garlic is surprisingly healthy! If you want to learn a little more about the nutritional value of garlic, check out these garlic nutrition facts. What exactly is an emulsion? If you would like to look into the science behind emulsions, check out this emulsion definition and examples.